Catalin Stef, SVP of International Operations at 3Pillar Global, has been named a Top Young Manager for 2016 by Business Magazine. 3Pillar Global, a leading developer of innovative software products, has been recognized on The Washington Post's Top Workplaces of 2015 List . A press release announcing 3Pillar's inclusion in the 2014 Washington Business Journal Fastest Growing Companies list. 3Pillar Global was one of 5 finalists for the first annual Tech Company of the Year award from the Northern Virginia Technology Council. A press release from 3Pillar Global announcing that the company won its second consecutive Fantastic 50 award from the Virginia Chamber of Commerce. 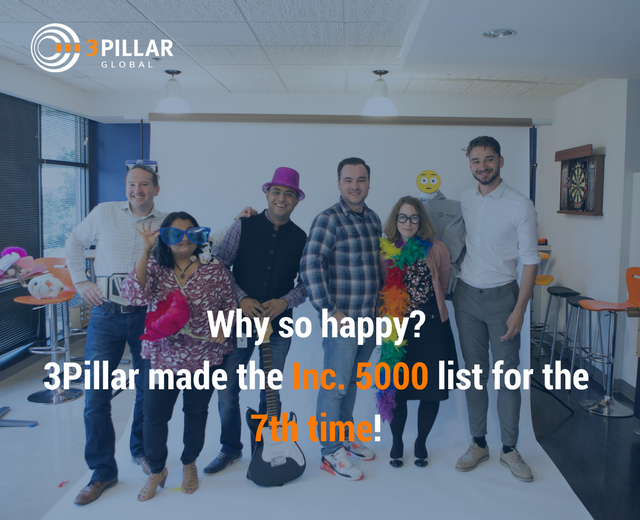 Press release on outsourced product development company Three Pillar Global being named to the Inc. 500|5000. Three Pillar Named to the 2012 Inc. 500|5000! Honor Recognizes Washington Area’s Top Business Leaders Under 40 Years of Age.